The Philippines has finally determined its destiny to develop its territory to make it more accessible and open to all Filipinos who want to visit and see or tour to the controversial disputed Spratlys archipelago. The Philippines must be thankful of China' Challenges to the country otherwise the country would be remain behind from all neighboring countries in Asia. The act of aggressive invasion of China towards Philippines territory wakes up the Filipinos that the time has come to defend and time has come to have a good posture that the Philippines is an independent country and capable to defend its territory. Finally, the Philippines have decided to develop the Kalayaan Municipality which worried china as they have already invested in their invasion to the undeveloped Philippines territory in Palawan province. Last year 2011, china tried to delete the old history of the Spratlys archipelago by buying all antique maps around the world that could have a different name of the Spratlys and replaced it with a name Nansha to support the china's claim base on their self coined history for Spratlys. Any map that would be different from what china proclaimed as the old spratlys were burned but still the UNCLOS is the strongest strength of the scared neighbor to stand and face the china's challenges. 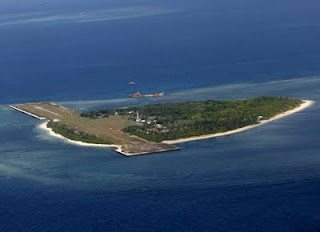 China has expressed concern over the Philippines' plan to build a beaching ramp in the Kalayaan island group in the West Philippine Sea. The Ministry of Foreign Affairs of China warned on Thursday against any move by claimants that may complicate the dispute. "China claimed that it has indisputable sovereignty over the Nansha Islands or the Spratly islands and their adjacent waters. China opposes any country's illegal activities that infringe upon China's sovereignty over the Nansha Islands," said Foreign Ministry spokesperson Hong Lei in a press conference in Beijing. The china's claim for indisputable sovereignty in the spratlys is the same as claiming having indisputable sovereignty over the Philippines as the Spratlys is in the Philippine Territory. Beijing for the national pride of china strengthen is stance in claiming the islands and waters of the Philippines territory after they submitted to the United Nations the 9 dotted lines claiming most part of the Spratlys including the Philippines territory in 2009. Beijing China has no way to back out as it could be a big shame to the world if they will back out its claim of the Philippines territory. Even though their claim is not according to the international law of seas (UNCLOS) and considered as illegal expansion by the international communities but still Beijing insist as they are now the world super power to admit defeat against small country like the Philippines. The Philippines municipal government of Kalayaan, in coordination with the Philippine Ports Authority (PPA), will construct within the year a beaching ramp on Pag-asa, the largest of the Kalayaan group, which has been occupied by Filipino troops for decades. Apart from the troops, there are about 70 Filipino families living in Kalayaan, which is a municipality of Palawan. Hong said Beijing is opposed to the Philippines' plan to build a simple wharf on Pag-asa, which China calls Zhongye and considers part of the Nansha Islands or the Spratly islands. "Relevant countries should abide by the spirit of the Declaration on the Conduct of Parties in the West Philippines Sea (South China Sea) and avoid taking any move that may complicate the dispute so as to jointly maintain peace and stability in the South China Sea," he said. Though Beijing is calling the ASEAN nations to abide the Declaration of Conduct (DOC) China itself keep violation it by harassing Filipino Fishermen in the Philippines waters and sending their warship in the area. Mayor Eugenio Bito-onon of the municipality of Kalayaan in Palawan, which has jurisdiction over Pag-asa and other islets in the Spratlys, said the PPA would construct a beach ramp with the help of the Philippine Navy. Bito-onon, who was visiting Manila last 3rd week of March 2012 for a series of coordinating conferences with concerned government agencies for the development of the island town, said the construction of the beaching ramp has been long delayed. He said the island municipality needs the beaching ramp for easier delivery of supplies for local residents. Once the ramp becomes operational, Bito-onon said this would further enhance the development of the area as roll-off/roll-on (RORO) vessels could be used to deliver and unload their cargo to the island municipality. In the absence of a beaching ramp in Pag-asa, cargo delivered by boat from mainland Palawan are hauled ashore by smaller boats. He said construction of the beaching ramp and the repair of the 1.3-kilometer airstrip are part of ongoing efforts to develop existing facilities in the Municipality of Kalayaan, Province of Palawan. Classified as a 6th class municipality of Palawan, Kalayaan has a regulated population of 67 families, mostly fishermen, aside from the soldiers who are deployed in the area. At present, the island has a water-filtering plant, power generators, weather station and a private telecommunication tower of Smart Telecommunications. Aside from the Filipino military contingent, other claimant countries except Brunei has deployed forward troops in their occupied islets and atolls in the archipelago to bolster their respective territorial claims in the region.